Did you know Long Island is home to more than 60 vineyards? They’ve been producing tasty reds, whites, rosés and sparkling wines for decades, and most of them are set among the rolling hills and quaint towns of the dreamy North Fork. We hear a day trip calling your name. Our version of a perfect day begins with flourless matcha pancakes at Bruce & Son on Long Island’s “other end,” continues with a stroll around charming downtown Greenport and ends at the stunning Kontokosta Winery. Take in the wind-powered waterfron vineyard’s incredible views of the sound while sipping on the juicy, full-bodied 2013 Anemometer red blend. What’s better than an ice-cream truck? A rosé truck. Croteaux Vineyards is the only U.S. winery producing and selling solely rosé, and while its tasting room is currently closed, the crew has been popping up all over the North Fork this summer with their Rosé on the Run truck. 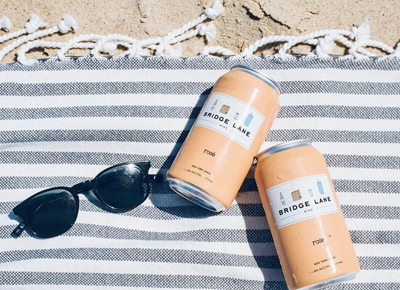 Find them at Little Creek Oysters in Greenport on Mondays and Tuesdays from 1 to 8 p.m. and follow them on Instagram for more pop-up locations. Picture this: You’re wearing a fancy yet casual tulle sundress, sipping sparkling wine while surrounded by your squad. Sound dreamy? Say hello to Sparkling Pointe, where all the wines are—you guessed it—sparkling, made in the traditional méthode champenoise. We’ll cheers to that. Shh...don’t tell anyone else about this magical Cutchogue winery. With gorgeous views, a low-key vibe and minimal crowds, Lieb Cellars is one of our favorite places to spend an afternoon. Opt for a flight to taste the selection of sparkling, red and white wines or grab a bottle and sit outside. P.S. If you see the winery pup, Jersey, make sure to give her a pat. The very good girl turned 10 this summer. While we can’t say for sure that former President Barack Obama was sipping a Bedell wine at the 2013 presidential inaugural luncheon, we do know it was the only time a New York wine was served at a presidential inauguration. Politics aside, family-owned Bedell Cellars is known for its handcrafted, sustainable reds and whites. Have a glass or two on the patio overlooking the vines.